2017 started with a bang when the New England Patriots came back from a 28-3 deficit in the fourth quarter, finishing off a choke of epic proportions in overtime. Remember the “Warriors blew a 3-1 lead” jokes last year? Well the roasts that followed this epic choke job by the Atlanta Falcons at the hands of Tom Brady and his New England Patriots is one hilarious meme to kick off the new calendar year. Despite being suspended for four games and missing his star receiver Rob Gronkowski, Brady and his Patriots finished with the NFL’s best record at 14-2. Atlanta had a breakout year aftering missing the playoffs three seasons prior. NFL MVP Matt Ryan lead his Falcon offence to the most total points on the season with 540. Along with a brick wall in the back end, the Falcons got the second seed in the NFC East with an 11-5 record. In the first half, it seemed like quarterback Matt Ryan had the game under control when he pushed his offence two touchdowns up on New England, the biggest deficit Brady ever faced which eventually grew bigger, being down 21-3 heading into the half time. Lady Gaga did some bizzare jump from the top of the NRG Stadium and continued with a colorful concert during the halftime show that for all we know, changed the outcome of the game. The Falcons defence were most likely mesmerized by Lady Gaga’s circus show which lead them to forget how to play proper defensive football. With a bit of luck, Julian Elderman’s insane catch between three Falcon defenders in the final quarter and Brady turning into GOAT mode in the final 15 minutes, the Patriots forced overtime and scored on the first possession. Brady finished with 42/66 in the passing game with a record breaking 466 passing yards. At the ripe age of 39, Brady carried his dominance into the new season as well. New England now have five Super Bowl titles to their name, putting them tied for third place all-time. Two titans in the 2017 MLB season squared off an in an epic heavyweight fight for the title between the 101-61 Houston Astros and the 104-58 money driven L.A. Dodgers. The Dodgers had a rough end to their season, dropping 11 games at one point in a stretch of losing 20 of 25 games. However, they won eight of their last 10 and managed to clinch the N.L West division title. On their way to the final, they swept a surging Arizona Diamondback squad and beat out the defending champion Chicago Cubs. A white-hot bullpen threw 23 consecutive shutout innings before the final and outscored opposition 48-19 in the process. Houston also made quick work in the first round, sweeping the Boston Red Sox and went the distance with Aaron Judge and the New York Yankees. The 113th World Series went the distance with Houston winning their first series in franchise history. MVP honours were given to outfielder George Springer who had five home-runs in seven games. The turning point of the series was a marathon game two that ended in the 11th inning, with Houston winning the contest 7-6. Houston went on to win game three as well before trading blows the rest of the way until the Astors bats came alive in game seven, scoring the five runs they needed and held onto their lead to win the title. Sidney Crosby and his Pittsburgh Penguins went back-to-back for the ones that didn’t get message, beating out a strong Nashville Predators team in six games. Pittsburgh made quick work of Columbus in the playoffs, beating them in five games. After that, they knocked out Alex Ovechkin and the President’s Trophy holders Washington Capitals for the third time in seven years in six, then squeezing themselves into the final, beating Ottawa in seven games. Playoffs are called a new season for a reason as they absolutely dusted the Chicago Blackhawks in four games to start the postseason, moved on to beat the up-and-coming St. Louis Blues and toughed out a six game series against a gritty Anaheim Ducks team before meeting the Penguins. In the final, Pittsburgh showcased why they are the model playoff team with a squad consistent of two-way players from top to bottom along with a stable presence in net with Matt Murray who posted a 1.70 GAA and stopped 0.937 percent of pucks shot at him. Murray also technically won the cup twice in his rookie year. In 2016, he came in relief during the playoff run against the San Jose Sharks. This season was Murray’s first actual rookie year. The Vegas Golden Knights became the 31st team to be added to the 2017/2018 NHL season. After nitpicking at other NHL rosters and forming a team that was assumed to be full of third line scorers and mediocre defence, the Golden Knights are sitting well above the wildcard spot in the competitive Pacific Division with a 16-9-1 record as of Dec. 4. A once forgotten thought turned into reality on Oct. 10 when an NHL hockey game was played on Las Vegas ice. The home opener against the Arizona Coyotes took place just days after the mass shooting where 58 people were killed in the Route 91 Harvey Festival. Vegas won 5-2 and became the first expansion team in NHL history to start a season 3-0-0 out of the gate. Dubbed the Money Fight, boxing pantheon Floyd Mayweather Jr. came out of retirement for one more big pay day and boxed UFC superstar Conor McGregor on Aug. 26 in the then future home of the Golden Knights, at T-Mobile Arena. If you were not in a bar or illegally streaming the fight, you would’ve had to pay a $100 USD premium to watch the fight from the comfort of your own home. After a series of staged and comedic press conferences, the boxing match took place with Floyd knocking out Conor in the 10th round via TKO. Many people were acting surprised at the fact that Conor did put up a fight in the first three rounds, essentially winning them by aggressively swinging his arms like the chump he is in a boxing ring, eventually tiring himself out. Floyd, simply toyed with the UFC fighter who had a very amature background in the sweet science and started to put on a clinic, round by round. He eventually started battering and out dueling his challenger until in the 10th round when the referee Robert Byrd stopped the fight. Mayweather was expected to earn minimum $100 million USD while Conor was guaranteed at least $30 million USD. Yes, the NBA season and playoffs were so horrid that Charles Barkley resorted to watch NHL playoffs instead and yes, we all called the rematch between Steph Curry and LeBron to happen in the finals. In the not so grande finale, Kevin Durant picked up his first ring in the weakest way possible by truly bringing the saying “if you can’t beat them, join them” to real life. Even though he did his part by averaging 35.2, 8.4 and 5.4 winning the finals MVP, to me and over half of the sport world, it shouldn’t be so celebrated. I mean, he did join a team who came off a 73-9 record the season prior and had a 3-1 lead in the playoffs over them but lost. Let me put it to you this way. Rihanna compared you winning your first title the way you did to losing your virginity to a prostitute, it really adds to everyone’s point. But that’s a story for another day. Nonetheless, LeBron also became the first player in NBA history to average a triple-double in the finals but his Cavaliers were simply out-matched in a series that had neither side play real defence. Devin Booker was the closest player to reach Kobe Bryant’s 81 point total in one game when he dropped 70 and Klay Thompson dropped 60 points in 28 minutes. So yeah, it was kind of an ok season. Real Madrid were also another team that went back-to-back and still hold the title of European champions. Las Blancos chalked up their all-time leading 12th Champions League title when they beat Italian giant Juventus 4-1 and became the first team to win two in a row since Milan did in 1990. In the playoff rounds, the Old Lady squad made quick work out of Portugal’s best talent in Porto, winning 5-0 on aggregate, went on to dust Lionel Messi and his Barcelona side, shutting them out 3-0 in two games and punched their ticket in by sweeping aside France’s A.C Monaco at 5-1. Cristiano Ronaldo and his Galacticos beat Napoli 3-1 twice, had a scare against German and heavy favourites Bayern Munich, beating them 2-1 and 4-2 in extra time during the rematch and finally held on against city rivals Atletico Madrid, beating them 3-0 but losing 2-1 in the second match to narrowly punch their ticket to the finals. Cardiff, Wales was the place to be at on June 3rd where the thriller kicked off. Despite being tied at 1-1 at halftime, three Madrid goals helped secure their European title thanks to a double from Ronaldo who finished with 12 goals during the European campaign. 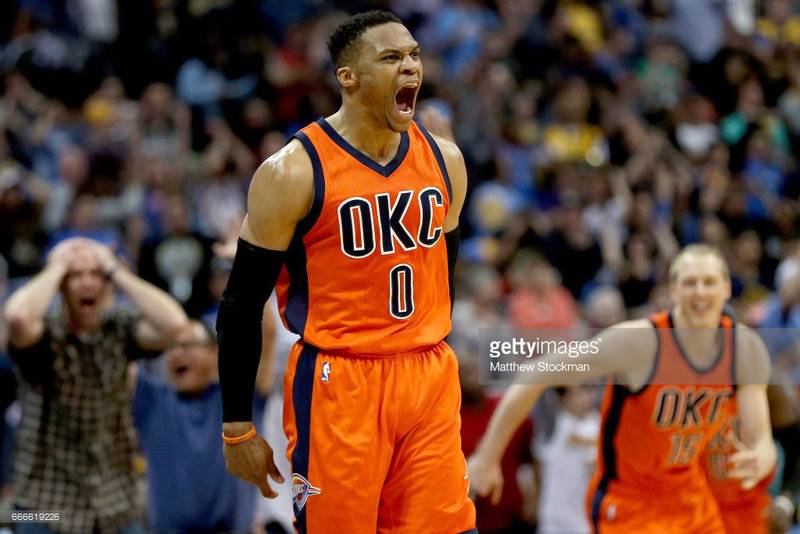 Russ Westbrook is a beast. This man broke Oscar Robinson’s 55 year old triple-double record of 41, tallying 42, while leading his team to a sixth playoff seed into the playoffs. This man was the definition of one-man-army. Only player in NBA history to win the scoring title, MVP award, and average a triple-double in the same season. Only player in NBA history to win consecutive NBA All-Star Game MVP awards, without sharing either. Only player in NBA history to average 40 points, 12 rebounds, and 11 assists over a 5-game span. Only player in NBA history to record at least 50 points, 10 rebounds, and 10 assists three times. Only player in NBA history to record a triple-double against every team in the NBA. Boxing icon and heavyweight Wladimir Klitschko hung up his gloves for the final time in 2017 after losing all his titles to Anthony Joshua. The Ukrainian juggernaut standing at two meters high ends his career record is 64-5 heading into retirement with 53 of those wins being via knockout. Overall, Klitschko holds the record for the longest combined world championship reign in boxing history at 4,383 days; the most wins in heavyweight title bouts in modern history at 25. He has the second most total successful title defenses of any heavyweight boxer with 23. Klitschko fought in 29 heavyweight title fights, more than any heavyweight champion in the sport’s history. He also holds the record of having defeated the most boxers with an undefeated record, at 12 while also defeating 10 current or former world champions throughout his career. Tennis and Spanish superstar Rafa Nadal is back to #1 in the ATP World tour from January to November 2017. He won six tournaments, winning four in a row at one point. His most notable wins were the U.S Open and the French Open. The pride of Spain won six tournaments out of 17 and winning $15,840,00 USD in earnings and jumped up eight spots in world ranking.